Official Union Company Battle Flags from the American Civil War are exceptionally rare in private hands. One can readily imagine this beautiful flag hanging from the color bearer's staff within the Union battle lines, with ranks of deep blue uniformed infantry formed for the attack. Over many years of collecting, I have seen several smaller silk swallow-tail cavalry pennants and perhaps five or fewer company-grade presentation colors in private collections, but this is the only full-sized military-grade primary battle flag for a Civil War Infantry Company that I am aware of outside of a state collection or institution. 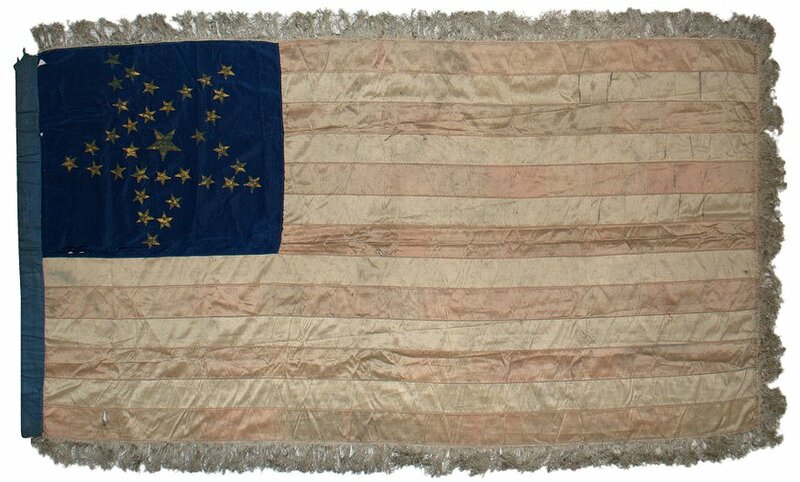 The flag descended directly in the family of its original owner, Captain John D. McFarland, company commander of Company F, 13th Pennsylvania Volunteer Infantry (and later re-flagged as Company L, 102d Pennsylvania Volunteer Infantry). 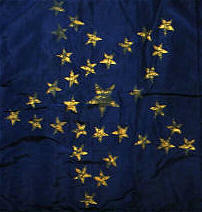 The gold painted Great Star with large central star is a one of the most highly coveted of all star patterns. The all-silk construction with blue silk hoist and fine silk fringe indicates that the flag is of the highest quality. The fading to the red stripes, apparent on both sides of the flag, and minor make-do repairs at stress points indicates that the flag was certainly flown and subjected to the elements. The unit mustered into service in Pittsburgh, Pennsylvania, on April 25, 1861, at the very outset of the war and nearly three months before the First Battle of Bull Run. As the founding company commander, John McFarland was presented the flag after leaving command due to illness in 1862. Along with the flag is the original set of fine braided tassels, which would have hung down from the flag staff. The flag is also accompanied by John McFarland's military commission signed by President Abraham Lincoln and Secretary of War Edwin Stanton, his Model 1850 Officer's Staff and Field Sword with scabbard inscribed "Presented to Capt J. D. McFarland by his Friends 1862", and his gold-plated pommel-style Grand Army of the Republic (GAR) Presentation Cane inscribed "Presented to Capt. John D. McFarland by Members of Co L 102d Regt P.V.V. July 26, 1891". On April 25, 1861 at Camp Curtin in Harrisburg, PA, twenty-five year old John D. McFarland was commissioned as a Captain in Company F, 13th PA Volunteer Infantry, a three-months regiment. He served with the unit until his muster out on August 6, 1861. One week later on the 12th, McFarland joined Company L, 102nd PA Volunteer Infantry as Captain and served in the unit until he resigned on July 8, 1862 for disability. From December,1862 to February, 1863, McFarland served on detached duty at Great Falls, Maryland. In November, 1863, McFarland again joined the service, this time as a private and was soon promoted to Captain and Assistant Adjutant General of US Volunteers and assigned to the Federal 15th Army Corps in Louisiana with General US Grant's army. Per orders, McFarland served with the 4th Division in Mississippi, Alabama and Tennessee until Dec 1863. During part of 1863, McFarland was involved in some irregularities regarding recruiting of substitutes. He was initially indicted but then cleared of any wrongdoing in February 1864. He was re-assigned as AAG, US Volunteers in the 2nd Brigade, 1st Division, 5th Army Corps at Petersburg, VA. in August 1864. McFarland resigned with an honorable discharge on October 26, 1864 and returned home to Pittsburg where he married and lived until April 16, 1918 when he passed away.